Big Toy Playground sessions are great fun for ages 14 and up! Participants under age 18 need a waiver signed by a parent or guardian. GIFT CERTIFICATES are always available for purchase. We can mail or emailed them for your special occasion. We generally are open from May 1 to October 31, depending on weather conditions. 90 minute session The Skid Steer, aka "Bobcat" is a blast to operate as you move dirt and work your way through our obstacle course. The time will fly as you become more coordinated and can operate with greater skill. You'll leave with a new confidence and want to come back for more. 90 minute session Test your coordination and feel the power of operating a backhoe. 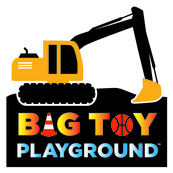 Challenge yourself at backhoe basketball or see just how deep you can dig. Our backhoe games will leave you with new skills and an appreciation for those operators you see on job sites. 3 hour session Twice the fun! Start with the skid steer, take a short break, then more fun on the backhoe.